WASHINGTON, April 27 (AP)-To get to the enemy first and leave last is the job of the Army's Rangers, their young commander, Colonel William O. Darby, disclosed today in the first official account of how the little band of night fighters and marauders operates. Darby is a veteran of battles in North Africa and Italy (he wears the Distinguished Service Cross, Purple Heart, Silver Star and the British Distinguished Service Order) and the organizer of the Ranger force. The Rangers went into action for the first time when they slipped ashore on North Africa in the pre-dawn darkness of November 8, 1942, before the enemy knew the Rangers were there. When the Nazis pushed the Allies back at Kasserine Pass, the Rangers' held off the Germans until the main body of Allied troops could take up defensible positions. At Anzio Italy, they went ashore to move into the seacoast towns and then advance as the beachhead moved inland. Orders came to infiltrate German lines in a night operation. "We accomplished the mission; the initial part was successful; the Germans had more stuff than we did, so we sort of got sawed off and lost quite a few Rangers," Darby said of that operation. The Rangers' specialty is this type of night fighting. During their training period six American Ranger officers and 50 men accompanied the British and Canadians on the Dieppe raid. From the nucleus formed in the British Isles, the Ranger force grew to a unit of three battalions during the North Africa and Italian operations. The first battalion formed consisted of 26 officers and 452 men. To date, the Ranger force is a volunteer group drawn from infantry regiments and armed with the easily handled light weapons of the infantry. In night operations, Darby contends, "the advantage is with the attacker; he knows what he is going to do." 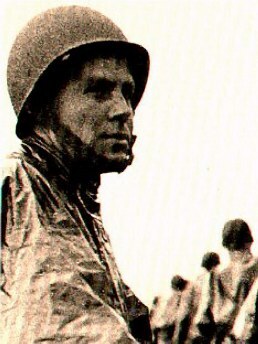 Darby emphasizes, however, that he does not believe 'night fighting will win the war, it's just one way of fighting.' Darby, was a graduate of West Point in 1939 and is a native of Fort Smith, Arkansas. Darby's Rangers saw their first action in North Africa on November 8th, 1942 in support of Operation Torch under the direction of General Dwight D. Eisenhower. As America prepared for the invasion of North Africa; under Eisenhower's command special task forces were created to handle the invasion. Three task forces were formed; the Western, Center and the Eastern. The Western Force's mission was the capture of Casablanca, the Center's mission was the taking of the City of Oran, and the Eastern was directed at the city seaport of Algiers. A classical amphibious landing was organized to pinch off Algiers. Patton was in control of the Western task force, while the Central force consisted of Darby's 1st Ranger Battalion and the Big Red One; the 1st Infantry Division. At Algiers the British came ashore with a Division of men, three Commando Units and a US Regimental Combat Team. The Rangers were transported by British vessels; HMS Ulster Monarch, Royal Scotsman and Royal Ulsterman, which were small boats pulled off of the Glasgow-Belfast ferry system. The operation was weakly supplied and weakly organized. But, it was the largest invasion of the war at that point. At Algiers the Rangers were forced to split their unit in half. Four companies followed Darby to attack the large Vichy French Fort of Batterie du Nord on a hill overlooking the harbor, and two companies under the command of Major Herman Dammer would attack the harbor fortress, Fort de la Pointe. Every unit in the Rangers is known for its commander, thus Darby's Rangers, and Dammers Rangers went into action. Dammer's force was onboard the Royal Scottsman, which lost a landing craft at sea and new plans were organized for the attack. Air reconnaissance provided details of their target. Fort de la Pointe sat in an artificial harbor enclosed by two jetties. It was composed of two separate positions, with a barbed wire enclosure guarding three coastal gun batteries, and behind those was a fortification with twenty foot vertical walls. The jetties were open or closed by the use of a boom that shut like a gate at different intervals, and was composed of a string of buoys on steel cables with anti-torpedo nets suspended. The assault craft had been modified to slip over the cable. Darby's force would be landed four miles southeast of Arzew. There they would follow the road until they reached a small valley near Arzew, travel up the valley and attack a ridge line battery of four 105 mm howitzers in concrete emplacements which were protected by heavy wire defenses. To the south at a distance of 500 yards was the main fortress of Fort du Nord, which was to be captured next. Darby's group went in under a fog narrowly missing a fishing boat and back on course after the Captain of the Ulster Monarch ran alongside and retracted their compasses. The entire force landed unopposed. A sentry was captured on the beach and the four mile march inland began. At 0100 hours on the 8th, the Dammer force dropped into their landing craft. The craft were brought to full speed to blast across the harbor boom, but the boom was open. Split by the jetty they found themselves lost in the darkness and headed towards the wrong side of the harbor. They turned a full circle in the harbor and headed for their target area along the docks of the harbor. Unopposed the craft landed and dropped their ramps. But one thing was not taken into consideration and that was a slime covered slanting sea wall that proved almost impossible to overcome. But the Rangers made it ashore and more prisoners were taken unawares, and the sentinel was talked down from his post by a French speaking Ranger and the force crept forward. Companies A and B swept around the hill and approached from the North, cut the wires, vaulted a low wall and after a short fire fight captured the guns and 60 prisoners. Darby's force was still two miles away from its objective. The battery on the hill had been alerted to the harbor action by this time. Darby split his forces , strung out Companies C, F, and E and they moved abreast, and he placed D company in position with 81 mm Mortars. The rifle companies approached the north side of the battery with concentric circles of barbed wire eight foot high and fourteen foot deep. The Rangers proceeded to cut through the wire, and cut through the wire and cut through the wire, until they reached the last strand, when the Vichy forces opened up with machine gun fire. Darby's mortars answered and silenced the guns within minutes with 80 mortar rounds. The Rangers vaulted through the wire and over the parapets and forced Bangalore Torpedoes down the barrels of the artillery pieces. At the main entrance of Batterie du Nord the French had barricaded themselves in the powder magazine thinking an aerial bombardment was underway. They were talked into surrendering. At 0400 hours victory signals were sent by use of green flares as Darby's radio had been knocked out. But, he was also supposed to fire white flares as authentication, but these had been lost in the landing. An hour later a British team was able to contact the main landing force. By dawn on the 16th, the 18th Regimental teams were ashore and the 1st Division. The larger fort surprisingly had not been alerted by the Dammer force. Using the ranking French officer the fort was called on the phone and its surrender was asked for. After token resistance the fort surrendered, but sniping persisted throughout the area. The entire Ranger force had suffered two killed and eight wounded. Dammer linked up with the 1st Division in the seaport and with the help of naval forces silenced sniping opposition in the harbor. But, it took three days to clean up all the snipers in the town. A lone battery opened up on the assault force at dawn, and it hit a ship in the harbor several times before the Rangers captured it. Lt. Gordon Klefman of Company C was killed near St. Cloud on the 10th when he and his men attacked an enemy mortar column outside of town. The Rangers were hit by heavy small arms fire, artillery and mortars. As Klefman lead one platoon to surround the French he was killed urging his men forward. Towards noon the Vichy surrendered, and the battle was over. Darby claimed four Rangers killed, eleven wounded; and the capture of several hundred prisoners and an infliction of heavy enemy losses. Editors Note: Darby's techniques were nontraditional. It was his style to size up a tactical situation instantaneously, and hit the ground running. Rangers were to fire their weapons, crawl or run for the objective without deliberate or conscious thought, with each Ranger knowing his job without hesitation or improvisation. The Rangers job was to get in and get out quickly undetected, inflict the highest punishment with the least amount of casualties under the guise of darkness or secrecy or both. Thus, the Rangers came ashore in North Africa. And prove the viability of such operations. The performance of Darby's forces in North Africa and the continuing need for troops to spearhead amphibious landings led Eisenhower's headquarters to form additional Ranger units. Patton and Maj. Gen. Terry Allen, commander of the 1st Infantry Division, praised the Rangers in glowing terms, and Allied planners requested authorization from the War Department to form two more battalions for the invasion of Sicily. Marshall approved the expansion but again stipulated that Ranger-trained soldiers be returned to their parent units once the need for the battalions had passed. His attitude underlined the continuing status of these battalions as temporary organizations. Nevertheless, Darby and his officers enthusiastically sought out volunteers for the new formations, making stump speeches at replacement depots throughout North Africa. At Nemours, where Dammer had created a replica of the commando training depots, the recruits endured physical conditioning, weapons training, and amphibious landings under live fire. In Sicily the Rangers served first as assault troops in the landing and then in various task forces in the drive across the island (Map 2). At Gela in the early morning darkness of 10 July the 1st and 4th Ranger Battalions, under Darby and Maj. Roy Murray, attacked across a mined beach to capture the town and coastal batteries. They then withstood two days of counterattacks, battling tanks with thermite grenades and a single 37-mm. gun in the streets of Gela. For all the courage of individual Rangers, naval gunfire support proved decisive in holding the town. As Allied forces expanded the beachhead, one Ranger company captured the formidable fortress town of Butera in a daring night attack, while to the west Dammer's 3d Ranger Battalion moved by foot and truck to capture the harbor of Porto Empedocle, taking over 700 prisoners. In the ensuing drive to Palermo, the 1st and 4th Ranger Battalions joined task forces guarding the flanks of the advance, and the 3d Ranger Battalion later aided the advance along the northern Sicilian coast to Messina by infiltrating through the mountains to outflank successive German delaying positions. By the fall of Messina on 17 August, marking the end of the Sicilian campaign, the Rangers were already preparing for the invasion of Italy. the invasion beaches and Naples. To the south the Germans contained the main landing, preventing Lt. Gen. Mark W. Clark's Fifth Army from linking up with the Ranger position. Nevertheless, Darby's three battalions, assisted by paratroopers and British commandos, held their position against repeated German attacks. Lacking enough troops to hold a continuous line, the Rangers adopted a system of mutually supporting strong points and relied on the terrain and naval gunfire, which they directed to harass the routes from Naples until Clark's force broke through to them on 30 September. Casualties mounted when the Rangers served as line infantry in the offensive against the German Winter Line. Lacking troops on the Venafro front, Clark used the Rangers to fill gaps in Fifth Army's line from early November to mid-December. Attached to divisions, the battalions engaged in bitter mountain fighting at close quarters. Although reinforced by a cannon company of four 75-mm. guns on half-tracks, they still lacked the firepower and manpower for protracted combat. By mid-December the continuous fighting and the cold, wet weather had taken a heavy toll. In one month of action, for example, the 1st Ranger Battalion lost 350 men, including nearly 200 casualties from exposure. Moreover, the quality of the battalions declined as veterans were replaced by enthusiastic, but inadequately trained, replacements. A botched infiltration mission on the Anzio beachhead in early 1944 completed the destruction of Darby's Rangers. After a nearly unopposed Allied amphibious assault on 22 January 1944, Maj. Gen. John P. Lucas, commander of the VI Corps, failed to press his advantage, and the Germans were able to contain the Allies within a narrow perimeter. Seeking to push out of this confined area, Truscott, now a major general and commander of the 3d Infantry Division, ordered the 1st and 3d Ranger Battalions to infiltrate four miles behind enemy lines to the crossroads town of Cisterna. One hour after their departure, the 4th Ranger Battalion and the rest of the division would launch a frontal assault and use the confusion created by the infiltrating Rangers to drive a deep wedge into the German defenses. American intelligence, however, had failed to notice a large German buildup opposite the American lines, and Ranger reconnaissance of the target area was poor. When the two battalions began their infiltration on the night of 29-30 January, the enemy quickly detected them and by dawn had surrounded them with infantry and armor just outside Cisterna. In a desperate attempt to rescue the isolated units, the 4th Ranger Battalion repeatedly attacked the German lines throughout the morning but succeeded in losing half of its combat strength in the futile effort. About noon, the remnants of the 1st and 3d surrendered. Only eight men escaped to American lines. Below is an Article from the Daily Oklahoman which describes for the first time in print Darby's methods of operations. Americans of the '40s were just as fascinated with special operations then as Americans are today! I have left the 'article' in single column as it was printed and intended. The headline and article is unedited. (1) This was Chapter 1 of a report prepared in 1991 for the Cunningham Family History Album; and is representative of the action of Darby's Elite Ranger Force in taking quick control of a beachhead. The sources include; but were not limited to; Darby's Rangers: We Led the Way, Rangers in World War II, The Spearheads and Commandos and Rangers of World War II. This is provided for educational purposes and was never intended for publication; but I didn't know there would ever be such a thing as the WEB. Some of this research dates back 20 years or more.